Use by firefighters to save lives and property - gives quick, easy access to critical data regarding shut-offs, floor lay-outs, how key base building systems function during an incident and how fire crews can best utilize the systems to manage an event. Use as a liability reduction tool - if any injuries or life loss occur during an emergency resulting in legal action against management and/or ownership, the Massey Plan can be presented to show the building met and exceeded code. The Plan goes beyond local code ordinances making the building safer than the law requires, reducing the overall scope of litigation and minimizing the risk of being found negligent. Use as a leasing tool - by showing prospective and current tenants that management/ownership takes life safety seriously and exceeds local fire codes with an Emergency Resource Pre-Plan for first responders prepared by the world’s top fire/life safety consulting firm. This shows a greater awareness of protecting occupants in a fire or other serious emergency, and will vastly reduce the potential of losses to tenants’ contents including critical records and equipment which are noted in the Plans. Use as a training tool for new building staff members - The Massey Disaster Plan can be used as a training tool to teach new employees about existing fire and life systems, as well as all base building systems. It is the most comprehensive program of its kind. The Plan is an excellent resource for staff members. 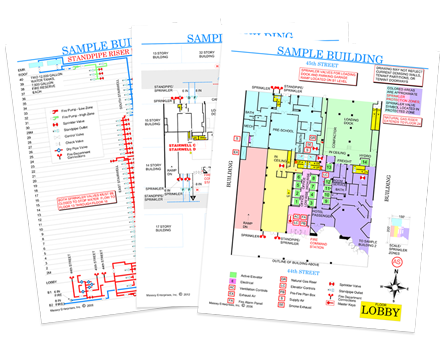 Use as an engineering daily reference tool - Engineering staff members use it as an instant reference tool saving valuable time spent walking the property or studying blueprints in search of shut-off valves and other various disconnects - especially during renovation planning. Use by insurance adjustors and auditors - gives concise, easy to follow information about building data and floor layout contents providing time savings during the auditing process. The Massey Plan is recognized and supported by the local Fire Department. Reduced rates may be available for residential and parking areas.